Road signage needs to be consistently defect-free. 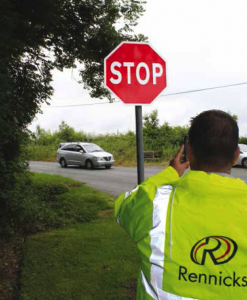 Our Nationwide Asset Management Service includes full sign surveying in accordance with NRA requirements for PPP tolled road operators. Dedicated trained and equipped crews are on hand to provide all levels of maintenance specified by the client. • A detailed initial sign survey, including digital photo and GPS coordinates. • The creation and installation of unique sign identifier on the poles. • The creation of a detailed database of all signs in a scheme. • Testing of the photometric properties (retroreflectibility) of individual signs. • Immediate minor repairs to signs not requiring sign face or post replacement. • Trimming and removal of intrusive vegetation near the signs. • Cleaning of sign face using specialized equipment. • The design, manufacture and installation of replacement signs if required. • Subsequent sign inspection at agreed intervals. Our industry recognized professional team provide Network Asset Management recommendations based on both legislative requirements and the invaluable practical knowledge gained from over three decades in the Road Traffic Signage industry.